We reviewed Avast! a while ago… Now, Version 7 has been released. In the last review, we gave it a score of 8.8 and a Silver Award. You can read that here. Here is some background information if you aren’t familiar with Avast! Downloading and installing Avast! was easy like usual. 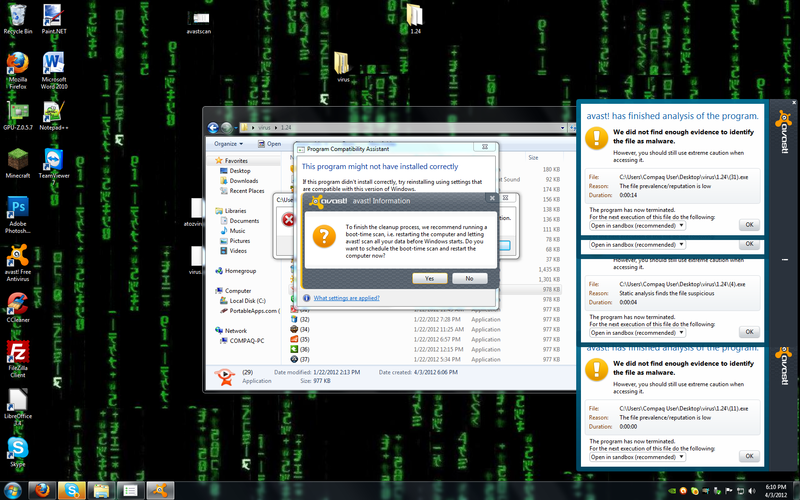 While 6.0 had a regular boring-looking installer, Avast! 7.0’s installer has been styled to fit the looks of the rest of the product lineup. Like most freeware downloads these days, Google Chrome is bundled with the installer and enabled by default. Funny thing is, last time I installed Chrome from a bundled installer (CCleaner for Windows), it simply disappeared after a restart of the computer. I haven’t tested the bundled copy on Avast! but I would still recommend downloading the latest version directly from Google instead of every using bundled installers. Avast! installs in less than a minute on almost any computer I’ve tried it on. Oftentimes, it doesn’t even require a restart after installation. The longest and slowest part of the installation is that it runs a Quick Scan of your computer after it’s done. There is no way to skip or cancel this step without cancelling the entire installation, which is frustrating. While Avast! Free Anti-Virus is a free download and has free updates to new versions and virus definitions, it does require free registration. You enter your name and email, and answer a random question (oftnetimes something like “On a scale of 1 to 10, would you recommend Avast!”… no big invasion of privacy here, just a minor annoyance. If you don’t register it immediately, you get a 30-day trial before you have to either register or go unprotected. The Avast! interface hasn’t changed significantly since the last review. However, v7 has changed the theme from orange and grey to yellow and black, along with more texture. Overall, I think it’s a positive change. What would security software be if it didn’t provide good security? We put Avast! Free Anti-Virus to the test, and have some great news to share with our readers: Avast! was able to block approximate 95% of all threats before they even got a chance to do anything, and those it didn’t catch it was able to remove completely with a Full Scan of the system. Overall, Avast! 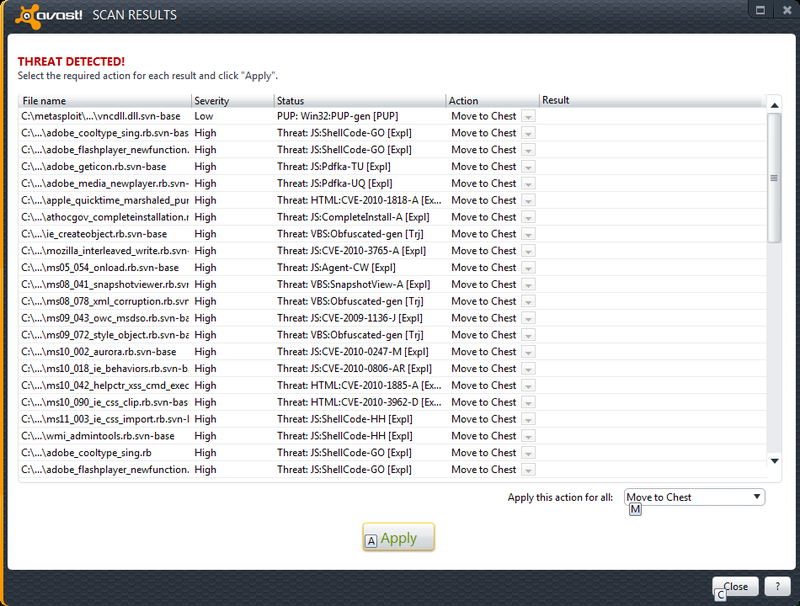 was able to remove 100% of the more than 4000+ virus samples we threw at it. That’s very impressive for free software, and even if it weren’t free, it would still be impressive! Of course, those results might not even apply to you, because Avast! does a fairly good job at blocking you from even visiting malicious websites before you can even download anything nasty, thanks to its Web Shield and Network Shield modules. Avast! Free Anti-Virus does not include a firewall. If you want a firewall, you’ll have to upgrade to Avast! Internet Security which starts at approximately $27/year/PC. However, the Free version already includes comprehensive protection against viruses, trojans, spyware, rootkits, and other malware. 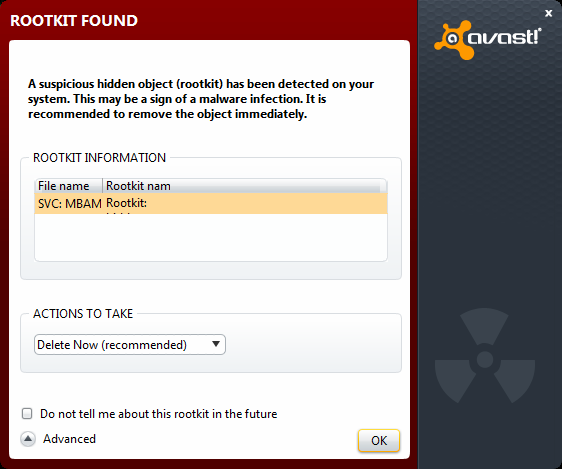 The only false positive Avast! has ever reported ever since I’ve started using it on almost all of my systems was that it though Malwarebytes’ Anti-Malware was a rootkit. And what’s the point of security software if it makes your computers so slow it’s unusable? Maybe that would be the ultimate seucirity, not using your computer at all, but for most of us that’s not an option! That’s why it’s important to see the performance on an anti-virus product. Avast! does fairly well in this regard, with low CPU usage, moderate RAM usage, and quick scan speeds. 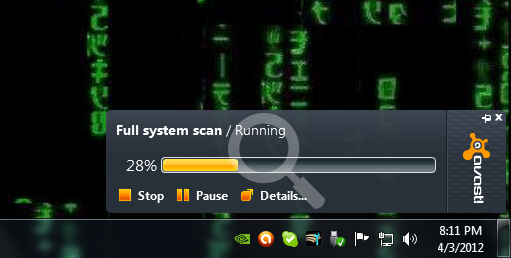 During a full scan, Avast! 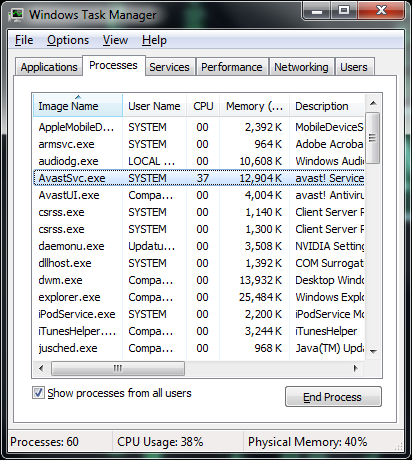 did use from 75-90% of the available CPU resources, even though when idle it uses almost none. Avast! 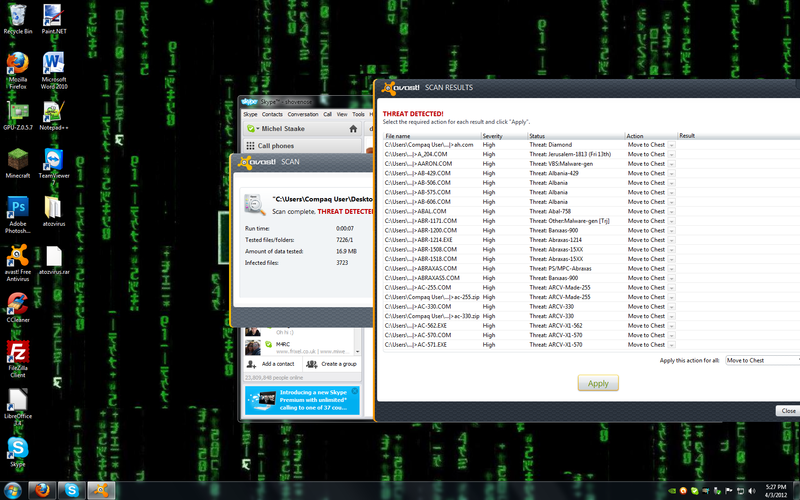 Free Anti-Virus has some extras worth mentioning. It’s WebRep plugin for Firefox, Chrome, Safari, and Internet Explorer warns you of the reputation of the website you’re on or about to visit, similar to what McAfee, Norton, and AVG include. Avast! is well known for it’s Boot-Time Scan. What that means is that after you schedule one, next time your computer starts up Avast! pauses the normal Windows boot-up procedure and, before the virus has a chance to initaliaze itself, scans the hard drive and finds any infections. Unfortunately, the interface for this is quite basic and ugly, but then again what’s to be expected in a pre-boot-time environment! And yes, Avast! talks. It announces updates, blocked websites, threats detected, and more. I personally like that, but if you dislike it you can change it in the Settings. You can also download new voices for your Avast! over at Avast.com. Avast! Free Anti-Virus is the best free anti-virus program available! It does a good job at securing your computer without slowing it down, and it’s got the terrific price tag of FREE! My only gripes are with the installer. Please, Avast!, don’t bundle Google Chrome browser; we don’t all want that trash! And make Registration optional, even though it’s a small price to pay for the piece of mind Avast! brings you. Avast! Free Anti-Virus 7.0 definitely earned the Hardware Insights Gold Award! Discuss this review in our forum.